Royal Fernwood Porcelain, a large-scale manufacturer of high quality white and decorated porcelain tableware and figurine ornaments, which enjoys a global reputation in the porcelain tableware industry as a reliable supplier to many premium brands, recently made a significant donation to an excellent cause, the Indira Cancer Trust. 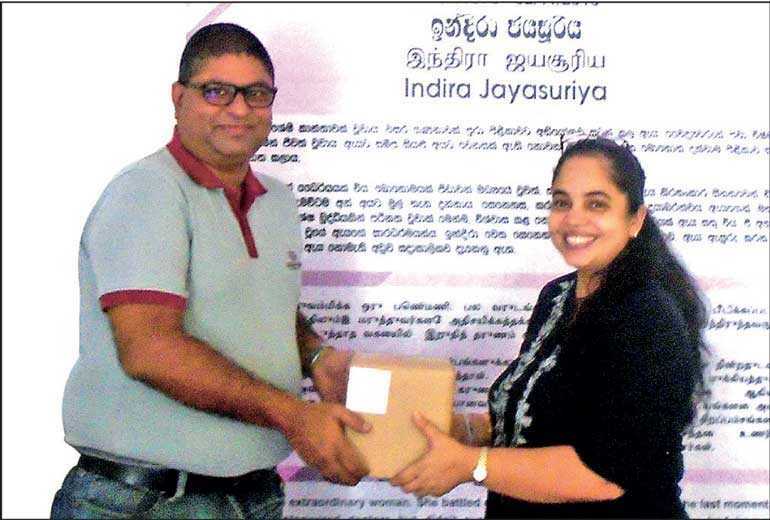 Taking the form of a gift encompassing a large quantity of porcelain tableware, Royal Fernwood Porcelain’s donation to the Indira Cancer Trust is part of the company’s continuing efforts to support its community and country in whatever way it can. Established in November 2016, the Indira Cancer Trust offers an array of much-needed support services to people living with cancer, with a special emphasis on providing information on any type of cancer care. Having teamed up with Apeksha Hospital in Maharagama, the Trust is currently involved in 25 projects aiding patients and their families who live with cancer. It also operates a highly useful Cancer Helpline, while at the same time providing several other very important services via the Indira Care Service and the Indira Paediatric Care department. Programs conducted by the Indira Cancer Trust have included the provision of financial aid, as well as support in securing medication, tests and scans, and even counselling and therapy and specialised paediatric care. The Trust has also helped breast cancer patients get breast prosthesis. Additionally, the Trust has offered educational scholarships, while also carrying out programs to uplift the spirits of the patients, especially children. One of the Trust’s most popular initiatives is its Birthday Program, which is incidentally also one of its very first programs. Beloved by the children at Apeksha Hospital, this program brings joy to many, many children, with them registering well in advance of their birthdays and wholeheartedly anticipating their gifts. This is also one of the Trust’s biggest initiatives with over 90 volunteers dedicated to supporting this wonderful program, with a number of other corporate sector contributors also joining in. Royal Fernwood Porcelain donated a significant quantity of Decorated Mugs to help meet this year’s requirements for gifts. Royal Fernwood Porcelain’s donations to the Indira Cancer Trust have also encompassed another vital and worthy function championed by the charity, which is the serving of meals and refreshments, including breakfast, lunch and tea, to families and individuals that come in for counselling and guidance and the multitude of other support services. Royal Fernwood Porcelain’s contribution aligns with the bigger idea of giving back to one’s community envisaged by the Ambeon Group. “Giving back to our family, friends, neighbours and country is a vital part of the Ambeon Group’s DNA and Royal Fernwood Porcelain’s exemplary contribution to the Indira Cancer Trust only buoys our longstanding commitment to helping those in need in any way we can,” stated Ambeon Capital PLC and Ambeon Holdings PLC Group Managing Director/Chief Executive Officer Murali Prakash. Royal Fernwood Porcelain, reputed for their coloured and youthful designs, enjoys the heightened value addition through a wide range of extremely popular designs and decorations that include in-glaze, on-glaze, under-glaze, hand painted, etching and microwave-safe designs including gold and platinum. Catering to customer demand, Royal Fernwood has been successful in developing new products using coloured glazes to match the body, which is a unique achievement for porcelain tableware. Body shapes are another competitive aspect that RFPL has excelled in, to retain and attract customers across the globe that have diverse artistic taste in porcelain products. Currently the company offers twelve main body shapes namely; Oxford, Princeton, Sofia, Helsinki, Coupe, Margia, Sunil, Colorado, Margo, Romantica, Dima, and Maria. Royal Fernwood Porcelain, a member of the Dankotuwa Group and subsidiary of Ambeon Holdings, prides itself as being a young, vibrant and colourful organisation manufacturing and marketing modern, contemporary collection of porcelain, designed and developed for that millennial customer. From sourcing the best raw materials from Sri Lanka, New Zealand, UK, Japan and China, to maintaining the best technologies from world renowned machinery manufacturers, such as NetschzGmbh of Germany, Drayton Kilns Co. Ltd of United Kingdom and Kajiseki (Takahama) and S.K.K. of Japan, Royal Fernwood Porcelain has always ensured that high quality products are manufactured under international quality standards complying with global statutory regulations. With a broad range of patterns for traditional and non-traditional applications, the company continues to introduce young people to elegant and fun fine-dining and other social experiences through its new collections and non-traditional sets.